To be honest, I have hundreds of photos taken in Prague- not kind of selfie or wefie (I bet it just 10% among others)-but kind of beautiful buildings and statues. As spoiler, this city is everything about art (building, sculpture, painting) and compositions. 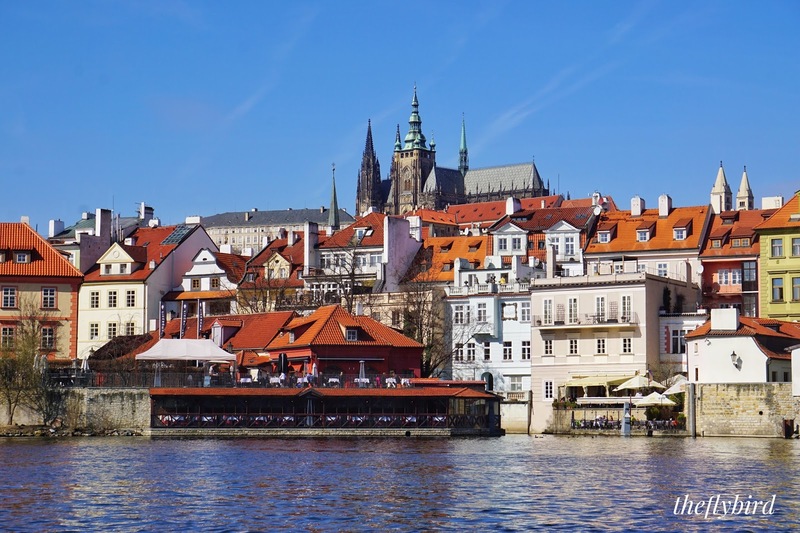 Different from other city in Europe, Prague was not rebuilt during 18th or 19th century especially during the Austro-Hungarian Empire. Many architecture heritages from Gothic, Renaissance, Baroque era remain intact and maintained. 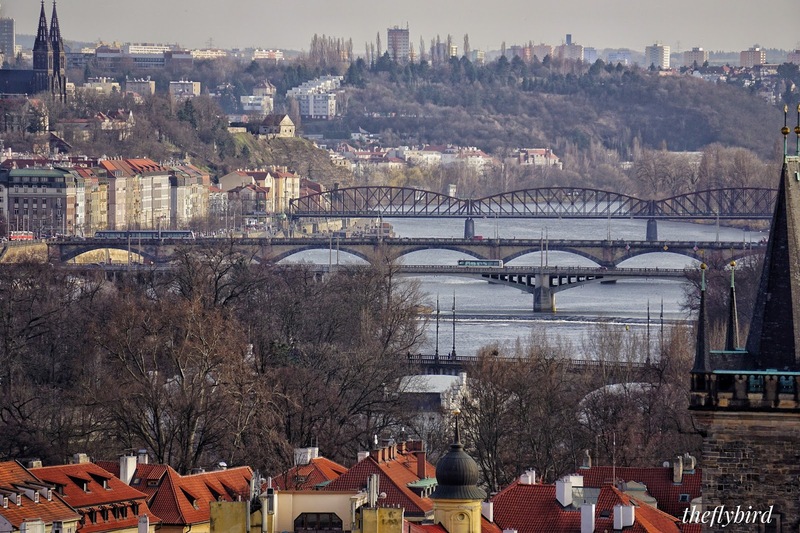 In a brief, Prague City divided by great Vltava River and parting the Old town in east side and Mala Strana in west side. Every beautiful point of interest is practically can be reached by walking. Arriving from Berlin via Regiojet, we took a cab from the Prague Florenc (Bus Station) to our stay at Charles Bridge Palace. 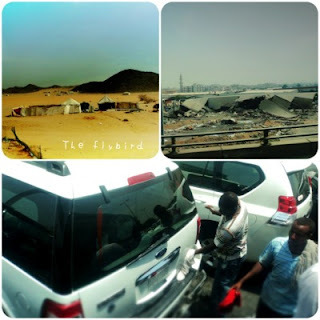 The cab car is new Audi sedan and we only pay arround EUR5 for 3 kilometers distance. At the terminal, we exchange our Euro to CZK and bought Burger King (which come very cheap-even cheaper than Indonesia!) for dinner. At the next morning, of course our first destination is the the famous Charles Bridge which lay accross our hotel. Before we went there, we took a photo of Bedrich Smetana statue just before the Charles Bridge. Bedrich Smetana is famous composer and regarded as father of music in Czech. We arrived at the bridge at 9 o'clock and there is less tourists and merchants. Just like I said before, every tourism point will be less crowd in the morning. At my first very step looking for the Charles Bridge, I know definitely why this bridge is much loved by anyone. The cobblestone, the originalities and beautiful sculpture are the answers how great and grand this bridge was. 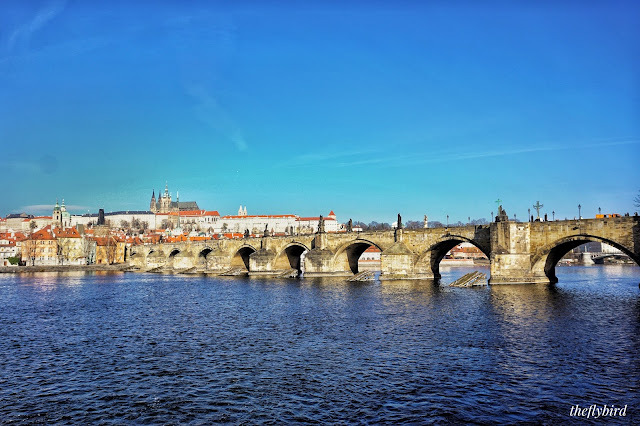 Imagine this bridge is built in 1357 under the auspices of King Charles IV and finished in the beginning of the 15th century. It tooks more than centuries to build this bridge and many of stones neede. The bridge itself is most important connection between the Prague Castle and the City's old town. Along 621 metres of the Bridge, there erected The Old Town Bridge Tower which also considered to be one of most astonishing Gothic Style buildings in the world. Not until 1700, the bridge is decorated by 30 statues-most of them Baroque style, but now all replaced by replicas. From the bridge, we can see the wide and clean Vltava River (which also frozen during winter time), some beautiful towers among the building and of course historical buildings along the river. 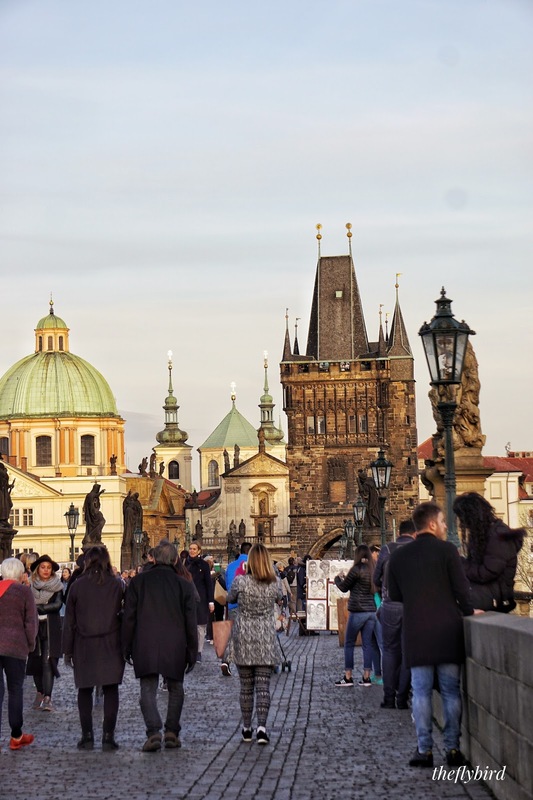 If you want to know much about the history and the famous building along the river, just take a boat tour below the bridge, it cost 350CZK or arround EUR 10 with additional free entry to Chales Bridge Musem. They will explain every detail history of each building along the river. 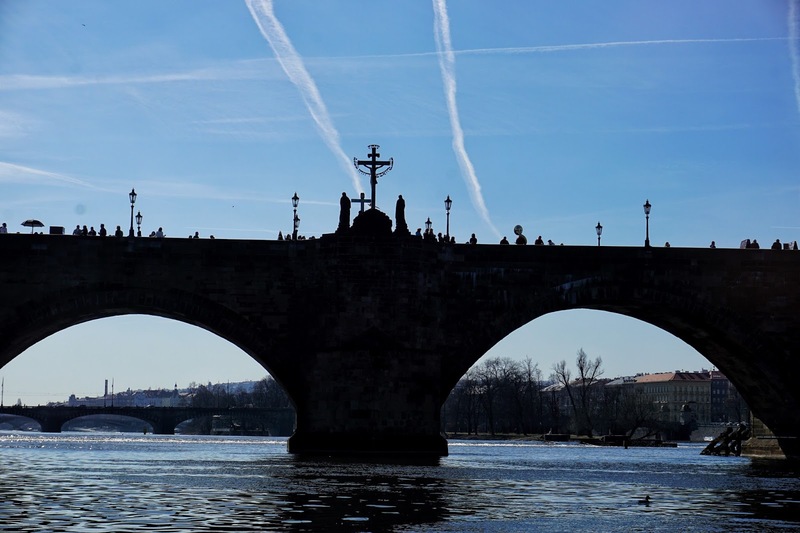 Even you won't go far from Charles Bridge, but the explanation is worth your curiosity in every penny. Do you know who he is? If No, then you can skipped it. Franz Kafka is the famous author from Czech who born in 1883 and died at the age of 40 years old. Kafka was born into a middle-class, German-speaking Jewish family in Prague and regarded as the influencer of 20th century literature. One of his famous work is The Trial. Located just slightly below the bridge in Mala Strana area, Franz Kafka Museum is like visual biography of the Author's life. How he was born in Jewish family, his childhood, houses, and his law-school. Until he became a lawyer in insurance company, how he juggling between his blue colar status and his needs to write are pretty much explained in the Museum. Like any author, his idealism made him struggle to face reality that sometimes, he cannot phantom. There is also his letters, to his father whom he create a formal relationship, to his employer - whom he ask several leaves, to his friends-famous friends whom he shared political views and of course his lovers. In Museum, you will find the missing puzzle i.e. 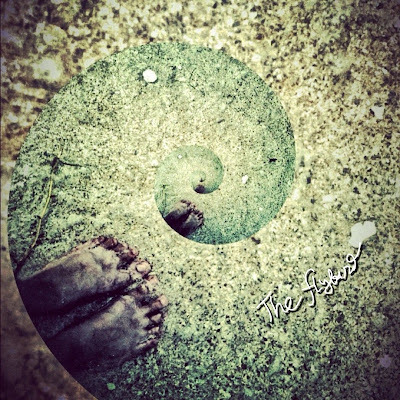 the backgrounds of his writing and got the reason why The Trial is so emotionally affecting. The museum admission itself is not expensive considering any other museum, approx CZK 200. Accross the museum, there is souvenir shop that you can buy limited edition posters or books. The wall continuously undergoes change and the original portrait of Lennon is long lost under layers of new paint. Even when the wall was repainted by some authorities, on the second day it was again full of poems and flowers. The wall represents a symbol of global ideals such as love and peace. 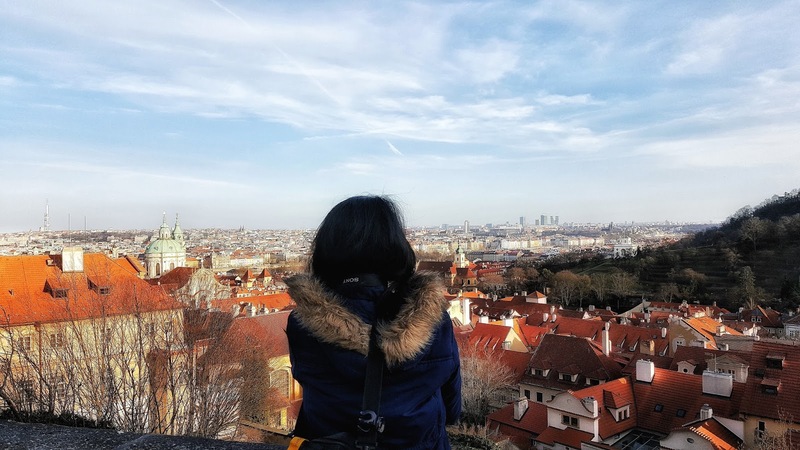 Walking from John Lennon Wall to Prague Castle, you can pretty much see everything. It is impossible for me to mention one by one beautiful buiding along the way. But I can start from the most stunning in my eyes. Since we walk pretty far, our first stop is beautiful park: Vojan Garden. The garden is survived from the middle ages up until now. The melancholy and serene bring alternate mood in the middle of busy city. After resting for awhile, we walk again to the Prague Castle complex. The first sign we are entering Prague Castle complex is the Black Tower. From there we were scanned for any suspicious items by the local police. Then as an first redemption for the long hiking trail, there is city view from above. The Vltava River dominating the view with its beautiful bridges, houses roofs, and several towers. Prague Castle was founded in around 880 by Prince Bořivoj. According to the Guinness Book of World Records, Prague Castle is the largest coherent castle complex in the world, with an area of almost 70,000 m². A UNESCO World Heritage site, it consists of a large-scale composition of palaces and ecclesiastical buildings of various architectural styles, from the remains of Romanesque-style buildings from the 10th century through Gothic modifications of the 14th century. 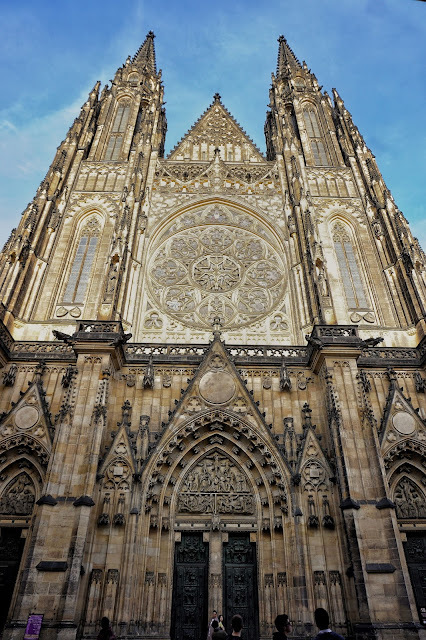 The most stunning building we see is the very decorative Gothic style Church, St. Vitus Cathedral. The cathedral is the largest and most important church in the country. Located within Prague Castle and containing the tombs of many Bohemian kings and Holy Roman Emperors. 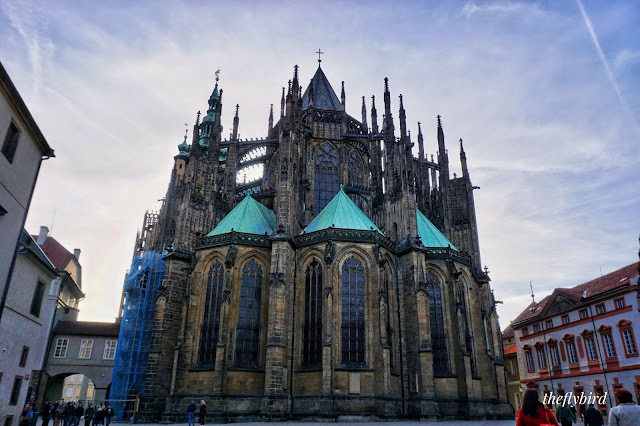 When we were stunned because of the St Vitus Cathedral, we almost didn't notice the St. George basilica in the right side. Different from St.Vitus, St. George looks rather more simple yet very beautiful. I didn't know how to put it in comparison because both have different architecture style. Basilica St.George bore the Romanesque Architecture Style with red colors as an accent. We continue to walk until into the courtyard of St Vitus Cathedral and we see how the St.Vitus tower looks stunning in front of the castle.Then I wonder why Notre Dame Cathedral in Paris more famous than St.Vitus even both have the same style. We went outside of the Prague Castle Complex and stop in the terrace to see another breathtaking city view. We sit in the fence and enjoy the fresh air while taking pictures. Hundred of pictures. The tallest and most different color between roofs and rivers is the magnificent St. Nicholas Dome. Several times, I watch photograph of this dome and I always thought it will be somewhere in Budapest. 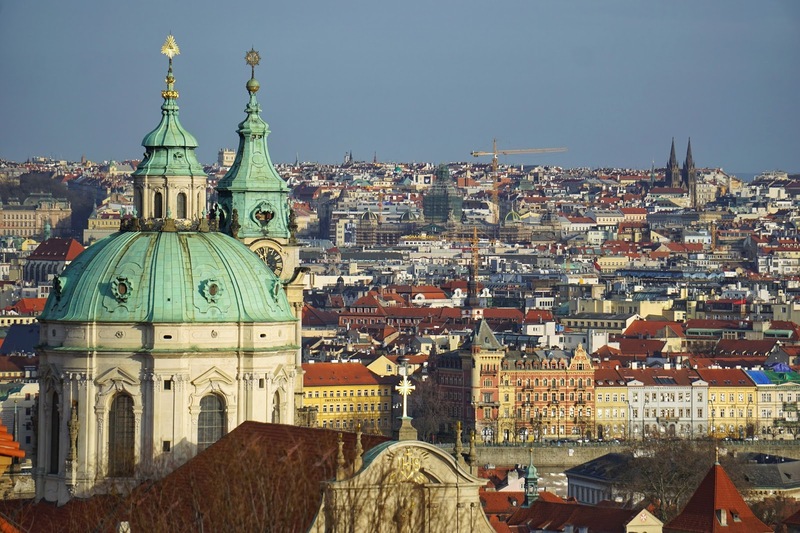 The turquoise dome is one of the finest examples of High Baroque architecture in Central Europe, this massive imposing dome and the Catholic church have continued to look over and protect the Lesser Town for centuries. Built by Christoph Dientzenhofer and his son Kilian Ignaz. To be honest, as a moslem, the dome shape reminds me so much with mosque in Indonesia. Finishing our tour, we continue to walk down the cobblestone path while wandering stores etalase along the way. Since we are running out of CZK, we exchange our EUR at the Western Union at Mala Strana. We didn't notice that they are charging commission fee in exchange. The rate in the display is the best among others but we didn't know there is commision fee 20% (darn!). This pissed me off of course. Our next tour will be at the Prague Old Town. We crossed the Charles Bridge and the crowd is more many than in the morning. Actually we don't have a plan to go any specific place, we just follow the path and the crowd while enjoying the feels of 13th century. We stopped at Old Town Square to see one of the tallest building in Old town, Church of Our Lady Before Tyn. It was first built in 1365, as Germans merchants provided funds in order to possess a main worshipping center. Right across the church erected the famous Prague Astronomical Clock. Not only that, if we see closely every building in this square are unique bore different architecture style. If you see this picture below, the church influenced by Gothic Style (12-16th Century) while right beside it, Kinsky Palace influenced by Rococo style (late 18th Century). Kinsky palace is also one of historical building. The palace was also used as a German speaking school where Franz Kafka was enrolled; his father operated a small stall on the ground floor, there is a plaque on the wall at the location. In the year of 1948, Klement Gottwald announced the beginning of Communism from one of the balconies of the palace; 42 years later, the beloved president Vaclav Havel proclaimed it would never again return. In my honest opinion, if you really want to enjoy the authenticity of middle ages city in large scale, Prague is one of the best, even compare to Vienna (well, it is personal opinion). Everything is so original and the development of new city isn't expansive any other city in Europe. Yet it doesn't mean there is no modernity. We can see the first ever Apple Museum in Prague or like Dancing House which built very out of the box. While we were on the bus from Berlin to Prague, the Bus attendants remind us how bad the cab service in Prague. May be in the past, there were scams frequently that's why she offered us to call trusted taxi in Prague. But that doesn't mean this city is less attractive, there are several options of transportation in Prague, you can take Uber or Tram or Bus in this city. I guess when you love history you can see how this city transform thru its building, art or sculptures. Since I am not kind of take a picture then go-visitor type, I apologize for the long posts and too much details. If I don't hold my self, I definitely spend days to tell a story behind every beautiful building in Prague. See you in my next city, then!